Kyoto is home to several shrines and temples that, despite their treasures and natural beauty, remain somehow unknown to the average visitor. Honpō-ji, a Nichiren sect temple in central Kyoto, is one of these hidden gems! 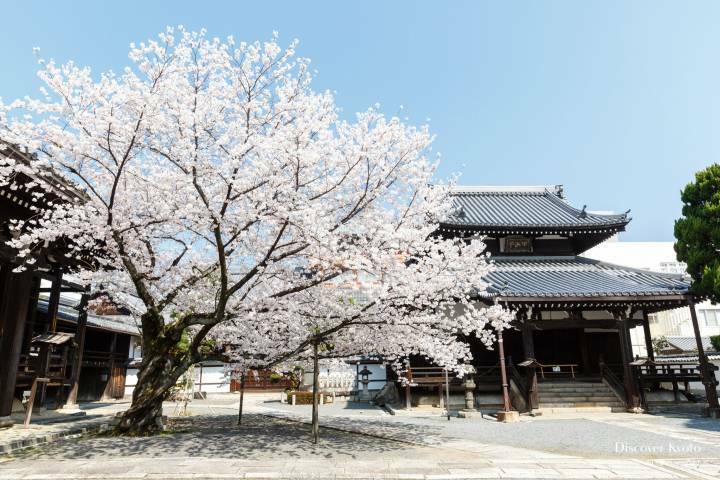 Especially recommended in sakura season when it provides a quiet place to enjoy cherry blossoms without the usual tourist crowds, Honpō-ji is also home to works by the famous 16th century Japanese artist Hasegawa Tōhaku. 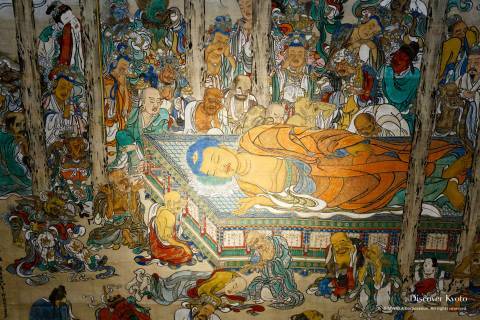 The most famous is his Nehan-zu (“The Death of Buddha Shakyamuni”) scroll painting, which is a whopping 10 meters tall and 400 years old! Honpō-ji also has a tranquil garden and a small museum, which makes it the perfect choice for the discerning visitor looking to enjoy a temple in peace. Honpō-ji’s serene grounds offer a chance to examine Kyoto’s gorgeous sakura contrasted against classic temple and shrine architecture. The tradition of painting scenes from the life of Shakyamuni is intrinsic to Buddhism, and one of the staples is the nehan-zu, depicting the physical death of the Buddha which signals his entry to Enlightenment. Though each painter takes certain liberties, the general scene involves the Buddha at the center, laid out on a dais in a copse of śāl trees surrounded by mourners human, divine, and even animal. 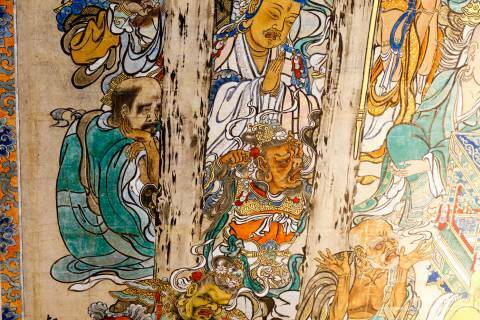 This subject has been covered in many dimensions, but the painting at Honpō-ji is one of the three largest in Kyoto at 10 meters tall and 6 meters wide. The artist and founder of the Hasegawa school of painting, Hasegawa Tōhaku (1539 – 1610), was a devout follower of the Nichiren sect, a danka (parishioner) of Honpō-ji, and a close friend of the temple’s head priest at the time. After tragically losing his son Kyūzō at the young age of 26, the artist focused his efforts on creating this Nehan-zu, a process that is said to have taken three whole years. Dedicated on April 26th, 1599, when Hasegawa Tōhaku was 61, the back of the scroll lists the deceased for whom prayers should be offered, which includes the sect founder Nichiren, the lineage of Honpō-ji priests, and members of Tōhaku’s family. 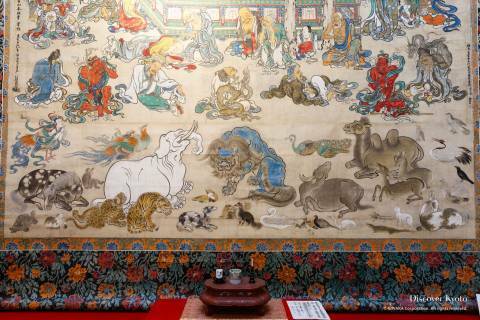 For approximately a month after the Nehan-e prayer ceremony that marks the anniversary of the Buddha’s death, the original 400 year old painting is displayed in the temple’s hall for all to see, but even during other periods visitors can still view a recreation of the famous work. Particular points of note include the realistic and varied depictions of grief on the mourners’ faces surely inspired by the artist’s own life, the difference in drawing styles illustrated in the various animals, only some of which the artist would have been able to draw after seeing them with his own eyes, and the mourner in green to the far left with his chin in his hand, which is said to represent Hasegawa Tōhaku himself. In spring, the grounds of Honpō-ji are overtaken with clouds of fluffy pink and white cherry blossoms. Lining the path from the temple gate, clustered around a small shrine, framing the tahōtō pagoda, and complementing the main hall, these sakura can be enjoyed without worrying about the crowds that can sometimes plague more well-known tourist locations. 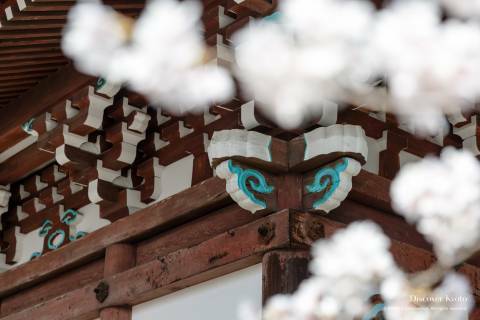 There is something quite a bit more relaxing about enjoying cherry blossoms undisturbed, and Honpō-ji’s serene grounds offer a chance to examine Kyoto’s gorgeous sakura contrasted against classic temple and shrine architecture. Honpō-ji’s main garden is called the Mitsudomoe no Niwa, or Garden of Three Tomoe, which are comma-shaped designs traditionally used in Japanese crests. This garden was originally designed by Hon’ami Kōetsu (1558 – 1637), a famous ceramicist, calligrapher, and lacquerer. Instructed in Nichiren Buddhist precepts by the head priest at the time, Hon’ami Kōetsu created this masterpiece at Honpō-ji. A karesansui (dry rock) garden, the Mitsudomoe no Niwa has a “waterfall” made of stones on one side, the movement of water illustrated by white streaks naturally present in the rocks. A small pond in the middle of the garden is home to summer-blooming lotus, a flower long held sacred as a metaphor for Buddhism, beautiful and clean though it springs from the mud. There is a stone fixture set into the ground to the left of this pond, which has a line through it to abstractly represent the kanji “日”, pronounced “nichi”. When put together with the lotus, whose kanji spelling of “蓮” can be read “ren”… you get a subtle homage to Nichiren, who started the Nichiren sect! Another point of interest is the stone lantern set towards the back of the garden, which as you may note seems to have splotches of warmer color marring the usually grey stone. It is said that this occurred when the Great Tenmei Fire ravaged Kyoto in 1788, burning so hot that the flames permanently changed the color of the stone. The small Tsunashi no Niwa, or Garden of Ten Stones, is located between the temple hall and the chokushimon (gate for imperial messengers). Though its name refers to ten stones, you may be surprised to count only nine scattered through the garden. In philosophical fashion, it is said that that the tenth “stone” that completes the set is the heart of the person who views the garden. This garden is particularly charming when the cherry blossoms are in bloom and their pink and white hues can be seen through the latticework of the gate. Honpō-ji was founded by Nisshin (1407－1488), a Nichiren sect Buddhist priest, in 1436. At that time, the temple was located on Ayanokoji street, near present-day Shijō Station. Nisshin was a dynamic preacher of the Nichiren sect revered for his powerful sermons, which eventually gained him an audience with the 6th Ashikaga shogun, Ashikaga Yoshinori. The contents of that sermon, which were contrary to more popular Buddhist teachings at the time, earned Nisshin a ban on preaching, which he violated in 1440. Imprisoned, his temple destroyed, Nisshin continued to preach even in prison to the point that it is said a scalding hot pot was placed over his head to keep him quiet. Because of this, he is sometimes known as the “pot-crowned saint”. Pardoned after Yoshinori’s death, Nisshin resumed preaching and rebuilt his temple in 1455, only for it to burn down again in 1460 when Nisshin ran afoul of the 8th Ashikaga shogun, Ashikaga Yoshimasa. During this imprisonment, Nisshin became acquainted with lord Hon’ami Kiyonobu and converted him to the Nichiren sect faith, establishing a bond with the Hon’ami family that would continue for generations. Nisshin and Hon’ami Kiyonobu were both freed through political maneuvering by their allies, and Nisshin returned to his religious activities and rebuilt his temple, where he preached until his death in 1488, aged 82. After a few more moves, Honpō-ji was relocated under Toyotomi Hideyoshi’s city planning initiatives in 1587 to its current location, and Hon’ami Kōji, son of Kiyonobu, donated to its reconstruction. Kiyonobu’s grandson, the artist Kōetsu, was said to have designed the Mitsudomoe no Niwa garden, and many works by Kōetsu, such as lacquerware, nō masks, and a teacup favored by Toyotomi Hideyoshi, are kept in the temple treasure hall. The 10th head priest, Nittsu (1551 – 1608), was close with Hasegawa Tōhaku (1539-1610), a famous artist who was himself a Honpō-ji parishioner. When he moved to Kyoto, Tōhaku lived at Kyōgyō-in, a Honpō-ji sub-temple, and in later life dedicated himself to the creation of a Nehan-zu painting for Honpō-ji depicting the death of the Buddha after his son Kyūzō passed away at the young age of 26. The process is said to have taken three years until completion. Unfortunately, the temple was ravaged in the Great Tenmei Fire of 1788, and only the treasure hall and the sutra storehouse survived. It was rebuilt through the efforts of parishioners, the gardens recreated, and it remains today as one of the eight great Nichiren sect temples in Kyoto.